We are an award winning Italian restaurant situated on the High Street of Shoreham-by-Sea with a delightful view over the river Adur. We have an extensive menu of traditional pizzas, pastas and steaks. We have a long experience of dealing with special dietary requirements - Gluten Free, Vegetarian, Vegan, dairy free etc, as all the dishes are made to order and cooked fresh. Been here a few times in recent months and every time the food is great and the service matches! 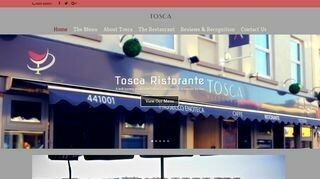 Been to Tosca many times and always been happy with service and food also find it reasonably priced, good restaurant. Taken the wife here a few times and food has been spot on, friendly service and really enjoyable. Excellent food as usual and the service was top notch. Waiter was really attentive to my other half and the fact she is coeliac.